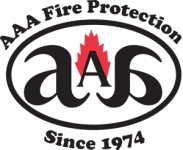 With more than 40 years of experience in fire suppression and fire protection, Vallejo businesses call AAA Fire Protection Services for all of their fire extinguisher services. In addition to providing fire extinguisher services such as testing and certification, we offer fire extinguisher sales so that your business or home is always protected with a quality and functioning fire extinguisher. A fire extinguisher is the first thing you reached for when there's a fire. Between the time that you call the fire department and the time they arrive, only a fire extinguisher is available to help you put out the fire. Without proper testing, fire extinguishers can fail. They are a piece of equipment that is under pressure and that pressure needs to be maintained in order for the fire extinguisher to work. Our fire extinguisher services tests fire extinguisher pressure and the capabilities of the fire extinguisher to function in the event of a fire. For more information about working with us or to schedule a fire extinguisher service call, just give us a call at (800) 543-5556.